Group Dining and Private Dining Concierge to help you find the perfect venue. Come back periodically to see our newest restaurant additions and news from the restaurant industry in Las Vegas. Mercato Della Pescheria is located in St. Mark's Square inside The Venetian. 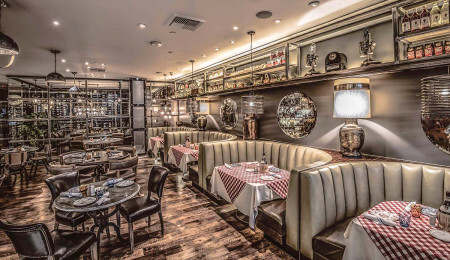 Miami import Mercato della Pescheria, the Italian seafood-and-pasta restaurant that opened in St. Marks Square at The Venetian last August, is joining the ranks of brunch locales in Las Vegas. Starting Saturday, July 29, brunch will be offered Saturdays and Sundays from 11 a.m. to 3 p.m., a bonus as most restaurants offer brunches on only Sundays. Mercato della Pescheria is located in The Grand Canal Shoppes at The Venetian. More: (702) 837-0309 and MercatoDellaPescheria.com.